Kolkata, Mar 12 : Finding fault in India's Look East and counter-terrorism policies, experts here on Tuesday stressed upon India's significance in fostering regional cooperation in South Asia. Participating in a two day conference on 'Building Pan Asian Connectivity', the experts, however, exuded confidence of a change in the scenario following positive steps by Prime Minister Narendra Modi. "India's counter-terrorism policy has been criticised by experts on grounds that it concerns only mid and short term responses. Some of the experts have said that it is mired in systematic weaknesses with terrorists having the upper hand," said Julio Amador III, Deputy Director-General, Philippine Foreign Service Institute. "However, under Modi, counter terrorism is being seen as a key national policy and seems to give renewed attention to terrorism as a security challenge," said Amador. Observing that most ASEAN members have had problems in effectively collaborating in combating terrorism, Amador said India needs to be consistent in it counter-terrorism policy. "The onus is on India to coordinate with the ASEAN members to forge closure cooperation in combating terrorism. It also need to consistent in its counter terrorism policy and spell out what it specifically wants from the ASEAN members regarding this," added Amador. RAND Corporation senior political scientist Jonah Blank said India's Look East policy was yet to translate into action. 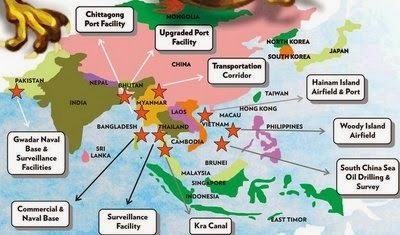 "When it comes to Sino-India rivalry in Southeast Asia, China is winning the trade war hands down. Though India's trade relation with ASEAN has improved, it is not very fast. India also lags China far behind in terms of connectivity. Commercial flights from India to the region are sparse," said Blank. "But with Modi government having fewer political constraints than its predecessors, there are reasons to believe that the present should not be like the past. Modi's engagement with Japan, the US and ASEAN as well with China are very positive signs," added Blank. Lamenting the lack of connectivity and infrastructural deficiencies, Sanjoy Hazarika, director of the Centre for North East Studies at Jamia Millia Islamia wondered why the north eastern state governments were not made stakeholders in India's Look East policy. "There is a need for greater inclusive approach. We have extremely poor internal connections with the North East- not only in terms of rail, road or air connectivity but also of services. If you don't have vibrant social services, roads and railways are not going do anything in connecting people," said Hazarika. "The problem is 60 years down the line, the central government still perceives North East to be a disturbed area. When the governments from here are not stakeholders how can you go ahead with such a policy," said Hazarika. "The need is to build new generations of politicians, scholars and professionals who can engage more in developing the cooperation. The focus should be more at the micro level initially then we can look at the larger picture," added Hazarika. Best improvements in Indian government can be started from taking advice and examples from eastern people. Democracy is a plain thing, that we need to keep going to. Today's inequality in India is too hard to handle, but it must be handled.